Dorian Hanaor, Yixiang Gan, and Itai Einav. 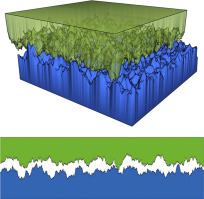 “Static friction at fractal interfaces.” Tribology International (in press). Abstract: Tribological phenomena are governed by combined effects of material properties, topology and surface-chemistry. We study the interplay of multiscale surface structures with molecular-scale interactions towards interpreting static frictional interactions at fractal interfaces. By spline-assisted-discretization we analyse asperity interactions in pairs of contacting fractal surface-profiles. For elastically deforming asperities, force analysis reveals greater friction at surfaces exhibiting higher fractality, with increasing molecular-scale friction amplifying this trend. Increasing adhesive strength yields higher overall friction at surfaces of lower fractality owing to greater true-contact-area. In systems where adhesive-type interactions play an important role, such as those where cold-welded junctions form, friction is minimised at an intermediate value of surface profile fractality found to be around 1.3-1.5. Results have implications for systems exhibiting evolving surface structures. This entry was posted in Publications and tagged contact mechanics, friction, publications, research, rough surfaces. Bookmark the permalink. Post a comment or leave a trackback: Trackback URL.